The Historic Centre of Vienna holds significant architecture from three periods (Middle Ages, the Baroque period, and the Gründerzeit), and is a capital of music. It still is a living tribute to Habsburg times. This dynasty ruled most of Central Europe between 1273 and 1918. Its emperor Frederick III transformed Vienna from a medieval market town into an imperial residence. This attracted other nobility and a lot of artists. Two of the city's most prominent buildings, the Hofburg and the Stephansdom, even date from the Habsburg beginnings early 13th century. 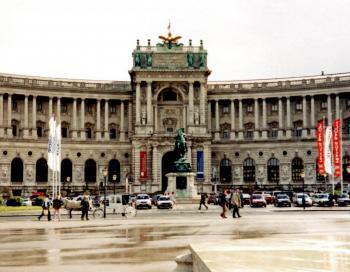 The Hofburg was its center of power - an evergrowing palace with over 2500 rooms. 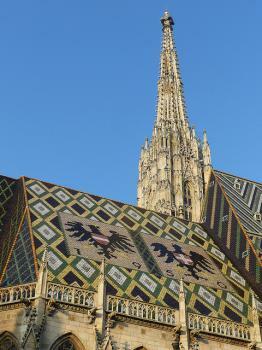 The giant Stephansdom features an 137 m. high church tower, and is adorned with coloured tiles. Inside, the stone prayer chair (dating 1514) draws the attention. It was made by Anton Pilgram, who portrayed himself on it. The former canal Graben now is a luxurious shopping street. Here you can find the exuberant baroque Plague statue (1679). In this area there are also many baroque and Jugendstil. Along the Ring, fine examples of 19th century architecture can be seen. Examples are the Rathaus and the Burgtheater. It's a joy to explore Vienna's center on foot. You don't have to worry too much about traffic, and this slow pace enables stopping every 5 minutes or so - to stare in awe at the buildings. Almost every one of them has special ornaments: iron balconies, circular towers, frescoes, statues, marble pillars. The City Hall ("Rathaus") is a relatively recent addition to Vienna's splendour (19th century). This huge building at the Ring is in neo-gothic style, and this way blends in very easy with its surroundings. Another highlight for me was the "Am Hof"-square - this is where the medieval predecessors to the Habsburg family had their main seat. Nowadays the fire brigade inhabits one of the magnificent buildings here. Vienna was a pleasant surprise. Having visited Prague and several German cities, Vienna does stand out because of its overall character: its cleanliness, the condition of its buildings and the general chique atmosphere. When traveling by train in central Europe, it's hard not to transit through Vienna, and the city is well worth a visit for the architecture and culture. This is the season for balls in Vienna, but when I visited the city with my siblings in the fall of 2003, we were off-season. Nevertheless, the tour of the baroque Hofburg Palace downtown was fascinating, and I enjoyed the opulent rooms and the variety of art and artifacts on display. Anchoring Stephansplatz, the gothic Stephansdom cathedral with its elaborate tiled roof and soaring bell tower was one of the most memorable sites in the city, and the interior was almost as beautiful. Also memorable was the baroque Karlkirche, with its elegant dome. Vienna is a city of music, with a long list of composers who at one time were employed there. Accordingly, we made pilgrimages to renowed performance halls which we had heard about, including the Muzikverein, the Konzerthaus, and the Staatsoper. Although the weather was a bit rainy when we visited, Vienna exceeded our expectations, and I would love to go back some day. Logistics: The Historic Centre of Vienna has excellent public transportation, with a well-developed network of buses, trams, and U-bahn and S-bahn rail lines. I visited Vienna in August 2015 and I spent 4 days exploring this magnificent city. I always knew Vienna was a beautiful city but I was pleasantly surprised at how well preserved it is and at how practically every facade, street and park is packed with historical, architectural and cultural sites to admire. The historic centre is huge and is much more difficult to cover when compared to Prague or Budapest. A day ticket for the tram costs 6 euros and it is worth buying to visit the farthest sites such as the Belvedere Palace (and Schonbrunn too). However, if you're fit and have enough time the best way to explore the city is on foot (paying attention not to end up with a stiff neck as you'll be looking up at the Jungendstil, Art Nouveau and Baroque facades and statues all the time!). The City Hall is where several important sites are situated: the Hofburg Palace, the Natural History Museum, the Fine Arts Museum, the Spanish Riding School, the Museum Quarter, Karlskirche, etc. Otto Wagner's creations are not only worth visiting but could be a WHS on their own as they really are of OUV. The Secession is my personal favourite in Vienna but all are really worth viewing. St. Stephen's Cathedral stands tall in the middle of the historic centre and I had long wanted to see its marvellous roof tiles. The Am Hof and nearby streets and buildings are always packed with people. Yet, they are outstanding to say the least. I believe Vienna is one of the best examples of historic centres in the world and my personal favourite after Rome and Paris. I'll definitely revisit in the near future (if only to allow for a day trip to Graz using the Semmering Railway). The international, Habsburger flair can be seen everywhere. I loved the food, the architecture, the Gemütlichkeit, and especially the castles. Bellevue, the Karlskirche and the Naschmarkt were the most fascinating objects. I loved Vienna! It was an amazing city due to its' history, palaces, artwork, churches and music. We spent several days here exploring both the city and the outskirts. Transportation by the train was easy and inexpensive. ?The food was excellent and the people very friendly. Within the city, they almost all spoke some English but just outside the city, not so much. Vienna was my first experience in a European city and it was magical! My grandmother was from Austria so the trip held some sentimental value as well. Why another review about Vienna? Vienna is one of the WHS with the most visitors and most reviews on this website. The answer is: just to draw attention to a building, that is often overlooked by tourists who spend only a few days in Vienna. Of course, the city is mainly known for the Hofburg, the Opera House, the buildings on the Ringstrasse, and Schönbrunn. But there are also extraordinary buildings of Art Nouveau. Well known are the Vienna Secession and the Karlsplatz Stadtbahn Station, mainly because they are located at tourist hotspots. The building, which I like in Vienna at most (if one can ever decide) is the Postsparkasse (Austrian Postal Savings Bank) built by Otto Wagner. The building covers an entire city block, and it is Wagner's most modern work. A characteristic feature is the façade with aluminium-covered iron bolts, which are reminiscent of a treasure chest. Wagner not only constructed the building, but also designed the complete interior: furniture, lamps, clocks, floor coverings, safes, etc. 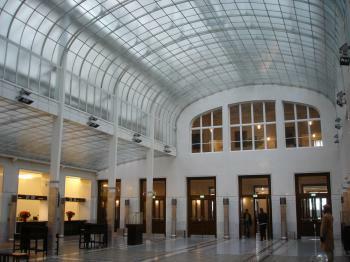 For example, a glazed prism floor was installed in the Banking Hall to light the rooms below., Both the façade and the interior perfectly illustrate his motto: What is impractical can never be beautiful. It is still used as a bank building, you can visit the Main Banking Hall from Monday to Saturday. There is also a small museum with a second, small Banking Hall. There are some more Wagner buildings outside the WHS core zone that are worth a visit: two houses at the Wienzeile (near Naschmarkt), the Kirche am Steinhof, and two villas in Vienna-Penzing. For the summer of 61 we went to Vienna with a group 50 people. Especially the Golden Hall in the Wiener Musikverein is something I never forget. Unfortunately I missed the tour to the Universität Wien, but from what I did see I think students in Austria are lucky. Terrific city, I look forward to seeing it! carries the city thru the coldest months. Spring brings the tourists in droves. Summer weather is celebrated in the outdoor cafes and Heurige. Bicycling along the Donau canal was one of my favorite Saturday workouts. Autumn brings some great new concert series and you should take in some classical music and performing arts since Wein is the musical Capital. It's impossible to even scratch the surface of a Wein experience in a paragraph but it's worth much so much more than just a stop on a tour bus. I too lived in Vienna for some time. I don't want to glorify this city further but focus on some of the museums found in the inscribed area - great works of art on their own right. Belveder is a grand palace now housing the Austrian Gallery of Art. It mainly exhibits Austrian art with Oppenheimer, Schiele, Kokoschka and Klimt as its main gems. The Belveder is also quite impressive as a palace. Mainly its lesser palace has some beautiful chambers. There's also the lovely garden connecting the two palaces. As its (for me unequal) rival (it is even better!) there is the Kunsthistorisches Museum (Museum of Art History) based on the Kaiser's art collections. Its exhibits are fantastic (especially Ancient Egypt, Rubens, Tizian and Breughel Elder). The building once again is a masterpiece built in a Neo-Baroque style but beautifully decorated in its interior by some Secession artists. Another must-see on this list is the Secession building itself. It used to be the centre of Avant-Guard art at the end of the 19th Century. Except of Klimt's Beethoven Fries there isn't much of importance to see inside though, but the outside is a good exemplar of this school's revolutionary style. In the Neues Palais (New Palace) of the royal residence you can see the Ephesos Collection (important findings from the now Turkish site), armoury, musical instruments and the royal treasury. All of these originally belonged to the royal family and are among the best of their kind in the world. I was in Vienna few times, and I always like to come back to this city. I always thought that once you visit some city, the next time you will be bored there. 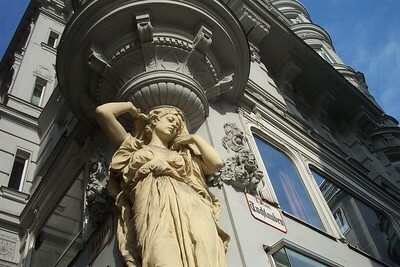 But in Vienna I never felt bored and there was always something new to discover. I could spend hours and days in Schonbrunn or eating some delicious cakes! Vienna is "my city" since I was born here and lived here all my life. Sometimes I feel like a tourist myself when I walk through the inner city and see all the tourists from far-away places admiring the architecture, the Sachertorte or the "Wiener Kueche" (Viennese cuisine), which is basically a mixture of Hungarian-Czech-Austrian cuisine (Gulyas for example is Hungarian). I love my city and I think it is a really great place to live. Vienna's center speaks volumes of the granduer of its imperial past. Without having any particular destination in mind, I simply enjoyed drinking in the atmosphere of this charming capital. Vienna, like Prague and Budapest, is a profound experience. Many commentators will describe the beauty of its baroque architecture, and endless other qualities. While these descriptions are often very accurate, one of its stand-out qualities is its people. I have been to Vienna several times and will be returning very soon because of the Viennese culture. My experience has been that the Viennese are, while relatively wealthy, particularly friendly. The Viennese are both gentile and sophisticated. I can only urge anyone who is travelling to Europe for the first time to start your European experience in Vienna. It would not be possible to properly explore Vienna under 4 nights or 5 days. Must see in Vienna; walk and walk the entire 1st District. This includes Hofburg Palace and St. Stephen's Cathedral. Also The Abertina, Belvedere and Schonbrunn palaces, and definitely a performance at Motzarthaus. Best time to go to Vienna. Anytime, but I love Vienna in the snow, but Spring is breathless, particularly Belvedere and Schonbrunn. Last, please learn some basic German, even it's to say please or thankyou! Vienna stands tall on a short list of cities that can lay claim to significantly influencing Western culture over the past centuries. It is a musical capital, fostering the emergence of the "Classical" style as expressed by Haydn and Mozart and nurturing the early Modern style as envisioned by Mahler and Schoenberg. Moreover, it is an intellectual capital, where Freud revolutionize the field of psychology. Still others in the fields of art, architecture, and literature have been inspired by its ambience and spirit. For those making the tourist rounds, the Innere Stadt holds many sights, including Stephansdom and the Hofburg, while the Ringstrasse, a wide boulevard following the foundations of the old city defenses, boasts a proud array of monumental buildings, worthy of any empire. Vienna's appeal lies mainly in its past, but it's a past that everyone should encounter and enjoy. I´m probably a little biased on this site, since I have been there so many (innumerable, practically) times. The World Heritage area is just the Inner City (the First District), plus a few areas besides (like the Belvedere Palace area), but it really captures the essence of Vienna and gives a great overview of its history, from the earliest beginnings as a Celtic and Roman settlement through the (frankly less remarkable medieval and Renaissance periods) to the time of Vienna´s greatest glory, the Baroque, when it was the capital of a huge empire, and on to the 19th century, when the Ring Street with the Parliament Building, City Hall, the University, the Opera, and the two great museums was built. So wandering around the Inner City takes you through all epochs in a short time, and there´s a lot to see, but the major, must-see attractions are St.Stephen´s Cathedral and the Hofburg, the maze-like Imperial Palace Complex. Most impressive is the Treasury, which contains priceless works of art from many periods. Sure, the city can get very crowded, but it´s easy to get off the tourist trail - just don´t take a map and let yourself get lost in the small streets and alleys. Sooner or later you´ll end up on the Ring. And since one of the major reasons for inscription on the WH list was Vienna´s role as a capital of music, a night at the Opera or at one of the many concerts is probably a must as well. I had received pretty mixed reviews about Vienna so I was not expecting much when I arrived. However I was stunned when I got to walk around, the wealth of Grand Buildings, Statues and Fountains left me pretty awe-struck. My first experience arriving was at dusk on a beautiful summer evening when I walked around the Ringstrasse as it was being lit up. During this stroll I even caught a choir in Stephansdom. In addition to the listed buildings in the centre I also really enjoyed visiting the unique architecture of Friedsensreich Hundertwasser, located just a short walk away. I was massively impressed by the city and there is so much to see that I would have no problem going back for another long weekend. I have visited the magnificent centre of Vienna thrice, and I plan to go back again. It is just endlessly fascinating. The city revolves around St. Stephen's Cathedral, with its enigmatic single spire. Apart from this, points of interest include the Cafe Central and other decadent coffee houses, the Stadtpark and the Strauss statue, the Danube which unfortunately was never blue but is fun to travel on by ferry, the Hofburg, Belvedere and Schonbrunn palaces, the Museumsquartier with several fine museums within walking distance of each other, the Musikverein and the Konzerthaus concert halls, the memorial houses of many classical composers, the Central Cemetary which is almost a museum, The Prater (fairground including the famous Ferris Wheel), numerous extremely ornate and beautiful churches (The Votivkirche and St. Peter's are the best of these), the UN headquarters in Vienna, The Rathaus (Town Hall), The State Opera (Staatsoper) and the Folk Opera (VolksOper), the House of Music (Haus der Musik), the Kärntner Straße and Mariahilfstraße shopping areas, the old-world Sacher and Imperial hotels ... the list is endless. Apart from these, the friendly Austrian people and the street entertainment top off one of my favourite cities. The metro (subway) is very comprehensive, and the Vienna Card for tourists is good value. Vienna, is indeed, the City of Dreams. Vienna, is a most stately, magnificent, majestic city. But the most majestic? It’s certainly near the top of the list, if not at the very top. Located along both sides of the Ring-Strasse, the many impressive things to see include the Opera, museums, castles, the Rathaus (city hall), Beethoven-Platz, the Stadtpark (City Park), several precision-planted gardens, and a guidebook’s-worth of things to see and do. Hours and days can, and should, be spent walking and looking at this most unusual boulevard. Vienna’s tourist map lists so very many churches, palaces, synagogues, academies, libraries, theaters, embassies, towers, and Government buildings. If you are hungry, in addition to the famous Sacher-Torte (cost up to $30) at Hotel Sacher Vienna, tried and true McDonald’s are available for a quick snack, or a restroom break. Vienna is one of the greatest cities in the world. I had the privilege to live there for six months and I can say that it was the one of the greatest times in my life. There is so much to do and see in Vienna. For the best tips on what to see, find the Mormon missionaries. They know all of the best places and many of which aren't frequented by tourists. Designed by Johann Bernhard Fischer von Erlach: Stadtpalais Strattmann, Palais Schönborn-Batthyány, Karlskirche, Hofbibliothek, etc. 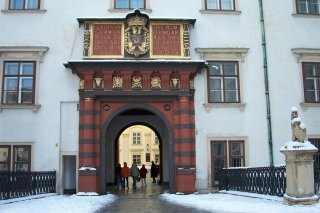 Universities: Vienna University: dating from 1365 and the historical Main Building is located on the Ringstra?e. Equestrian Statues: 4 Field Marshals (von Laudon, von Daun, von Traun and von Khevenhuller) as part of the Maria Theresa memorial at Maria-Theresien-Platz (1888). Archduke Karl (1858 - The 2nd oldest in the world to only have 2 of the horse's legs attached to the pedestal) Heldenpatz.. 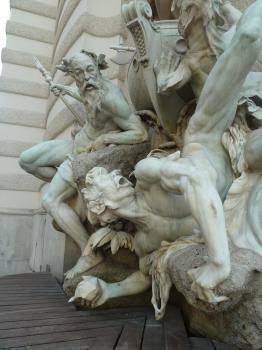 Prince Eugen (1865) - Heldenplatz. Archduke Albrecht (1899) - in front of Albertina. General Radetzky (1891) Ringstrasse. Historical Financial Institutions: Wiener Börse: one of the world's oldest exchanges and was founded in 1771 during the reign of Empress Maria Theresa of Austria in order to provide a market for state issued bonds. Hitler was here: Numerous. Hitler lived there from 1905-14 and visited it in triumph after the Anschluss in April 1938. Among "Hitler related" locations within the inscribed area are Hotel Imperial - Kartner Ring. Stayed there after the Anschluss. Eva Braun (then unknown) had room next to his. Heldenplatz/Hofburg - made speech from balcony of the Neueburg to crowd in Heldenplatz on March 15 1938 after the Anschluss Academy of Fine Arts (Akademie der bildenden K?nste). Schillerplatz. Rejected Hitler as a student in 1907 and 08. Moctezuma Family: Moctezuma II's crown is kept in the antropological museum in the Hofburg since the 16th Century. Naser ed-Din Shah: "This day we have to go to the city of Vienna and visit the Exhibition." Religious sites connected to fishermen: Maria am Gestade, "traditionally used by sailors on the Danube"
Hotels in Historic Buildings: Hotel Imperial was a city palace of Duke Philipp of WÃ¼rttemberg. European Route of Historic Theatres: Emperor Route: Theatre an der Wien dating to 1801, where many important events in Austrian theatre history took and still take place. 694 Community Members have visited.